Most of us think of single-family home foreclosure as the main story in the housing crisis, but multi-unit foreclosure and the effects on tenants is the other half of the issue. Fifty percent of the housing stock in Chicago is rental units. Forced tenant relocation creates untold hardships—children placed in new school systems have trouble adjusting; tenants on average are in temporary housing for seven months; and when housing is finally secured, the rents are usually higher, creating more hardship. CDH interprets a community’s pain at the 2007-08 economic crisis and investigates the isolation imposed on a neighborhood’s residents as family upon family becomes displaced. We’ve all been taught that boot-strapping are the ideal, but can we put aside ideas of self-sufficiency and merely share with each other? Can we, as a community, place faith in one another rather than systems that no longer serve us? 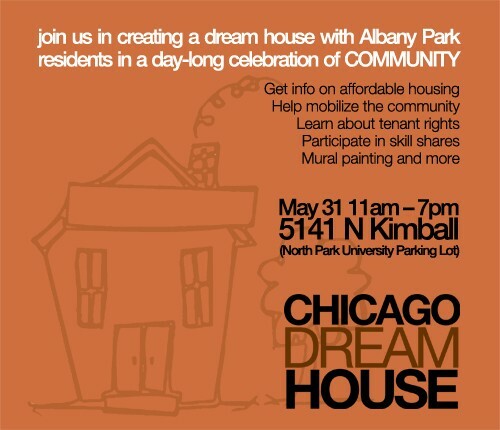 We are partnering with the Albany Park Neighborhood Council, an organization committed to housing and youth issues, in a single day, members of the community will build a “dream house” while programming from diverse neighborhood-based initiatives takes place simultaneously. We are using community interconnectedness as a way to create sanctuary as a new model of stability.